A screen shot of the real Peter Strzok’s Twitter account. The trouble is, it wasn’t Peter Strzok who wrote it. Anyone who looked even a little bit carefully would have seen that the user name on the Twitter account that shared the post was @NotPeterStrzok, not Peter Strzok’s verified Twitter account, @petestrzok. Civics Lesson: Who Is Peter Strzok? Peter Strzok worked with the Federal Bureau of Investigation as a counterintelligence officer for 22 years. He was the Chief of the Counterespionage Section and led the FBI’s investigation into Hillary Clinton’s use of a personal email server. He was promoted to Deputy Assistant Director of the Counterintelligence Division, the second highest position in the agency, and led the investigation into Russian interference in the 2016 election. Strzok was born near Sault Ste. Marie, Michigan, in 1970. His father was a longtime member of the Army Corps of Engineers. Strzok received a bachelor’s degree from Georgetown University in 1991, after which he served as an officer in the U.S. Army before leaving to join the FBI in 1996 as an intelligence research specialist. He received his master’s degree from Georgetown in 2013. 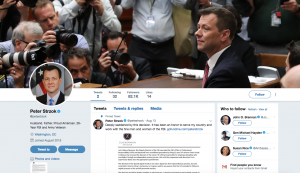 So, how did this fake Peter Strzok Twitter account emerge? The Washington Post decided to find out. It turns out that the mastermind behind the @NotPeterStrzok account is a 21-year-old Pakistani who works as a “content and academic writer” and says he manages social media accounts for some Asian celebrities. The fake Strzok account is not the first parody account this individual (who didn’t give his name to the Post for fear of being harassed) created. He’s created a bogus Twitter for a Bollywood actress that was quoted by Pakistani media, and he also made a fake Twitter account to impersonate former acting Attorney General Sally Yates. Most of his previous fake accounts have been suspended by Twitter—and, as of August 17, so has the @NotPeterStrzok account. At the time @NotPeterStrzok created the fake account, the real Peter Strzok didn’t have a Twitter account. Now he has a verified account. After the individual finds a person to target with a parody account, he then finds people who are already trending on Twitter and tweets about the individual he’s trying to impersonate. Once that’s done, he “makes them aware of his account by following them.” If the person being followed believes the account is legitimate, they might start tweeting it, too. He was able to make the @NotPeterStrzok account look legitimate by taking an account that’s been around for a couple of years and renaming it. Look at the username (on Twitter, that’s the one with the @ next to it under the name in larger type). If it doesn’t look like a real account, don’t retweet or share on other social accounts. If the account is for a famous person, check that the account has been verified. On Facebook and Twitter, genuine celebrity or politician accounts have a blue checkmark near the account name. Many parody Twitter accounts have information in the bio that states they are parody accounts. This seems to allow them to avoid Twitter’s rules around impersonating people. Look for problems with spelling and grammar. Use the CRAAP Test to determine the legitimacy of information being shared by the account. Don’t instantly share a social media post because you agree with its content. Think before you click! What it all comes down to is that people—including us—need to take a breath before retweeting or re-sharing a post that reflects our attitudes. We promise to do better in the future, and we hope you will, too. Were Russia Warnings Ignored and Forgotten About?